PINO RARE FABULOUS BEAUTIFUL ORIGINAL HAND EMBELLISHED GICLEE ON CANVAS. Hand signed and numbered. Ceritficate of authenticity included. Additional images are available upon request. Please do not hesitate to ask further questions. Born Giuseppe “Pino” Dangelico Daeni in Bari, Italy,(1939-2010) Trained at The Art Institute of Bari and later at Milan’s Academy of Brea, perfecting his skills painting nudes and figures and was heavily influenced by the Pre-Raphaelites and Macchiaioli. After establishing himself as a successful artist in his native land, Pino decided to immigrate to the United States in search of further artistic freedom and opportunity. He is known for his unique style of feminine, spectacular romantic women and strong men painted with his loose but accurate brushwork. Considered one of the highest paid book illustrators of his time. His popularity grew quickly within the literary community, becoming the artist-in-demand for Zebra, Bantam, Simon and Schuster, Harlequin, Penguin USA and Dell. Over the decades Pino illustrated the covers of over 3,000 books, movie posters and magazine illustrations, with his unique style dominating the market with his work garnered several prizes and awards including commissions by some of Italy's largest publishers, Mondadori and Rizzoli. In 1992, Pino felt the strain of tight deadlines. Eager to leave illustration behind to return to his Impressionist roots, he contacted one of the major galleries in Scottsdale, Arizona and sent five paintings, which were well received. Pino made several appearances on major TV networks and interviews in international journals. While working as the industry’s top illustrator, on the side Pino painted fine art oils; this body of work has become his trademark. 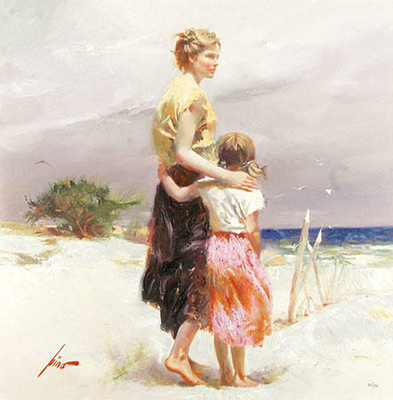 Pino’s unmistakable artworks create feelings of warmth, nostalgia, love and family often set on picturesque beaches on the Mediterranean where he grew up. Pino’s exceptional ability to capture the movements, expressions and deep contemplation of his subjects has brought his artwork a worldwide following and many commissions for private portraits. In 2001, Pino's son, Massimo, began representing his artist-father and successfully grew his efforts into a profitable company expanding beyond his normal gallery representation. His rich and vibrant work closely mirrored his personality. Pino’s technique and hallmark style demonstrates why his original artworks, limited edition giclées and serigraphs are highly sought after by art connoseurs and collectors worldwide..
Click the button below to add the Hand Signed Seaside Summer By Pino Retail $3K to your wish list.